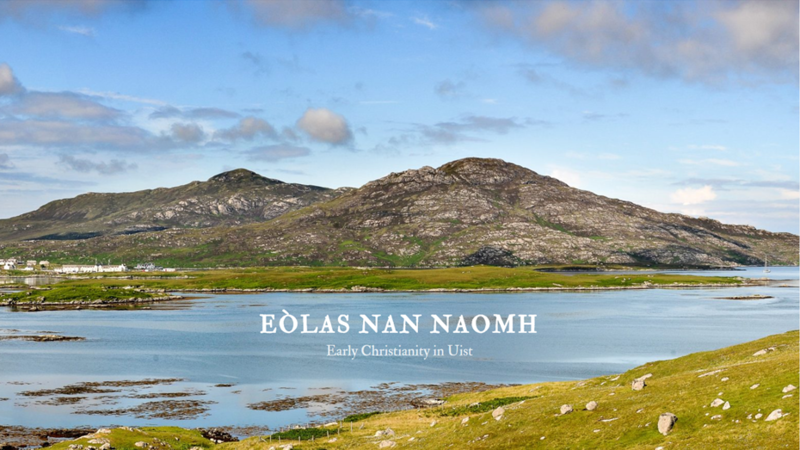 The new term of the Centre for Scottish and Celtic Studies seminar series commenced on the 25th September with Professor Clancy and Dr Evemalm’s presentation on their project Eòlas nan Naomh: Early Christianity in Uist. 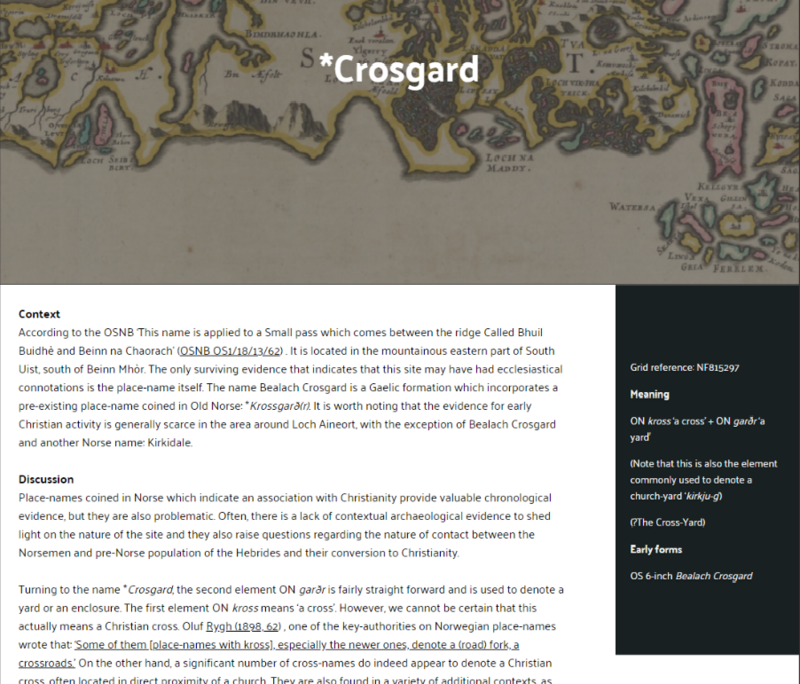 The project, which investigates early Christianity in Uist through place-names associated with Christianity, mainly hagiotoponyms, and archaeological evidence, is jointly funded by Bòrd na Gàidhlig and Ceòlas, and the analysis of initial findings can be accessed via https://uistsaints.co.uk/home (note: website still under construction). Professor Clancy began the talk by explaining the aims of the project; namely the construction of a web resource which will provide information about early Christianity in Uist, drawing on relevant research from the earlier Papar project (http://www.paparproject.org.uk/) and identifying sites of place-names which are of interest for the furthering of our understanding of early Christianity in Uist, as well as a discussion of the saints’ cults associated with sites in Uist. Professor Clancy then discussed some of the problems facing the research, the primary issue being that most of the early medieval period is ahistorical and we have no historical texts which directly relate to this area – this leaves the question of when does Christianity reach or develop in Uist? The available archaeological evidence is ambiguous, and although it does demonstrate secular occupation and thriving communities, there is no clear evidence of religious association. The examples of stone crosses that survive indicate the presence of Christianity in Uist, however, these are hard to date. Therefore, the project intends to utilise the study of place-names, and especially hagiotoponyms, as a way of accessing information about the presence and character of Christianity in medieval Uist. Dr Evemalm followed Professor Clancy’s initial introduction to the project with a detailed explanation of the project’s main output – a bilingual English/Gaelic website which will display the findings of the research. 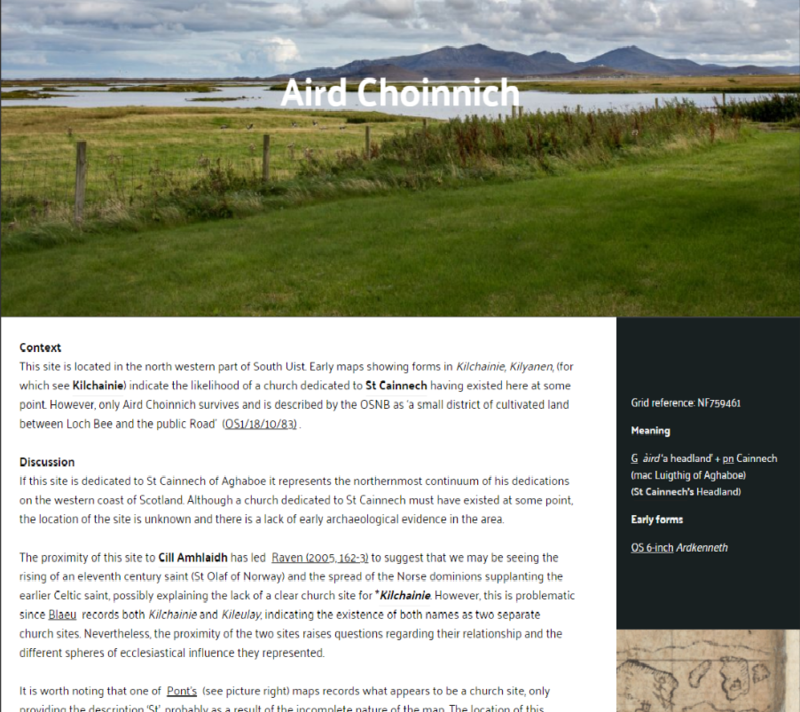 Crucially, the website has been designed with the people of Uist in mind, and a key concern of the project was that the findings be presented in a way which is accessible to the residents of the island. 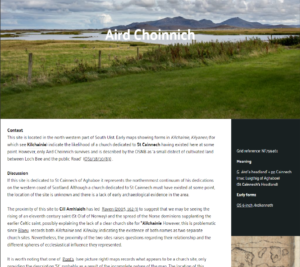 The English section of the website is being constructed first, and the Gaelic will follow. The research has identified 46 place-names of interest from the initial survey and these are presented on the website as head-names under the divided geographical sections of ‘North Uist’, ‘Benbecula’, and ‘South Uist’. Within these place-names have been identified 15 saints, and these are also listed as head-names under a separate section. There is also a map where the 46 place-names are pinpointed. This means that there are three different ways for users to access the information on the website, allowing for navigation based on location or on specific saints. Once the user has accessed the webpage pertaining to the place-name of interest they are able to read the available information about the location, background, meaning and early forms of the names. Pictures of the sites under discussion are also provided where possible. Dr. Evemalm then discussed the next stage of the project, which is to draw more on local traditions surrounding the names and also to examine the nature of the relationship between Norse settlers and early Christianity in Uist. 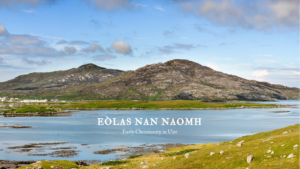 The Norse place-names in the area are more dateable and provide clear evidence of settlers moving in and interacting with early Christianity in Uist and therefore can further illuminate our understanding of the nature of early Christianity on the island. Dr. Evemalm highlighted Kirkidale and *Crosgard as two examples of Norse place-names as well as the name of the site pictured in the website heading, Beinn Ruigh Choinnich (most likely referring to Coinneach mac Luigthig of Aghaboe). Professor Clancy finished the talk by going over a couple of examples of the place-names identified from the initial survey, demonstrating how the study of Christian place-names and hagiotoponyms may enable us to answer the questions such as: who are the saints associated with Uist? ; what is the chronology of Christianity on Uist?. In particular, he discussed: Cill Amhlaigh, which is dedicated to St Olaf whom we know to have died in 1030 (meaning that the name can’t be any older than this); the two lost names in Cill Chainnich, dedicated to St Cainnech or Coinneach of Aghaboe in Ireland; and Cill Donain, noting that this place-name has interesting parallels with Kildonnan on Eigg, and which may give us our best chance to contextualise the cill- names on Uist. The online output of this ongoing project will no doubt result in a useful and engaging resource for tracing the development of Christianity in Uist through the place-namescape of the island. The next Centre event is courtesy of Professor Meg Bateman (Sabhal Mòr Ostaig, UHI), who will be discussing ‘Fenian and Cú Chulainn Sites in Skye’. Join us at 5.30pm in No.3 University Gardens on 16th October. All welcome!